You may not realize this, but helicopters are essential to maritime work. These flying transports keep things moving and are commonly used to shuttle supplies, resources, and manpower from shore to offshore worksites and vice versa. Unfortunately, as with any piece of machinery, defects occur, and accidents happen. When a helicopter crashes during a maritime flight, a proper response needs to happen. Serious and even fatal injuries may occur, and those on board deserve every attempt to be rescued. Unfortunately, these types of accidents require additional helicopter support to transport the injured, putting more workers at risk for an accident. Defective parts. For helicopters to work properly, a precise and complex set of electronics are required to work together to maintain flight, steering, and safety. When faulty parts or negligent engineering compromise these electronics, the pilot will be unable to control the chopper. 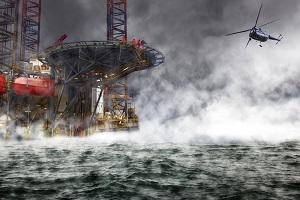 Without control, even moderate of breezes can send the helicopter spinning toward the ocean, docks, an oil rig, or even offshore ships. Pilot error. Piloting a helicopter takes precision and control. When a pilot loses that control or miscalculates his bearings, he can cause the chopper’s trajectory to become erratic, which could ultimately lead to a crash. Bad weather. Strong winds, torrential downpours, and large waves are frequent dangers maritime pilots face while navigating above waters. Unfortunately, these acts of nature can be ruthless and easily shake, rattle, and roll helicopters off course. If the pilot isn’t able to stabilize the chopper and regain control, the weather could wind up bringing the helicopter down against the pilot’s wishes. When these accidents occur, and a rescue operation is not immediately undertaken, the severe consequences of a crash can be made worse. It doesn’t matter what or who the downed helicopter was transporting—cargo, manpower, or even injured workers from a previous crash—when a helicopter accident occurs, passengers aren’t only susceptible to crash injuries but other dangers as well. In addition to broken bones, severe burns, and neck or head injuries, helicopter crash victims are also at risk for drowning (if the crash was over water), or for becoming trapped in a fire or explosion (if the impact occurred on the ground). Your loved ones deserve better than this. The fortunate news for those involved or those who have loved ones involved in a maritime helicopter crash is that you may be eligible for compensation. Generally, maritime workers are afforded special opportunities to recover financial compensation because of the dangers inherent in their jobs. Nevertheless, helicopter crashes occupy a unique position between maritime law, aviation law, and normal workers’ compensation law, depending on the circumstances. As a result, filing a claim can be exceedingly complex. In order to file a claim, you must be able to show fault and prove liability. This is where attorney Steve Lee comes to the rescue. Steve Lee has 38 years of experience serving the needs of injured maritime workers. He can help you collect the resources and information you need to file a strong claim against the correct liable party. Call our office today at 713-921-4171 for a FREE consultation or fill out our online contact form to schedule a review of your case.